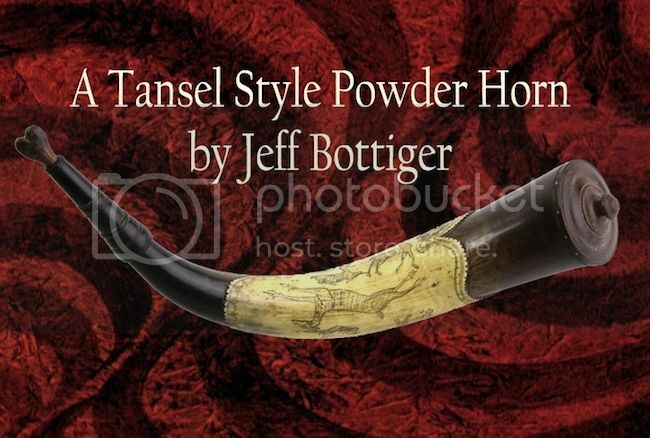 Though once only regionally appreciated as a “mid-western” powder horn, today top dollar is eagerly paid to own just an average Tansel carved piece. But for a truly fine or early example, discriminating collectors of early American folk art will set records trying to outbid each other. One of the finer examples of a Tansel carved horn is the “double fish-mouth” or scalloped horn attributed to Francis, circa 1810. Once part of the Dresslar collection this horn has recessed, chip carved scallops at both ends. The center raised portion is carved with standing deer, a bob cat, and interweaving designs. An American war eagle clutching arrows and a vine stands in the center of a cameo cartouche below thirteen stars and the legend “E. Pluribus Unum”. Full time horn maker Jeff Bottiger of Edgar Springs Missouri has made an exacting copy of this horn for our 2013 CLA fundraising auction. Jeff’s simple mission statement as a professional hornsmith is “To learn…To Grow…To Share…and To Educate.” Donating such a fine example of his work to the CLA is his way of putting that statement into practice. Just like the horn crafted by Francis in 1810, Jeff’s example has a traditionally lathe turned and applied spout. The beautiful wooden base plug and strap button are also turned. And the shaping and carving of the horn are all done by hand with files, saws, and knives. The auction horn has been specially finished and aged to match the look and patina of the original, and is fitted with one of Jeff’s signature heart shaped stopper pegs. Jeff has captured the true look and feel of an exceptionally fine “Tansel Style Horn”, and just like the originals, it is a fine example of early American folk art in its own right.